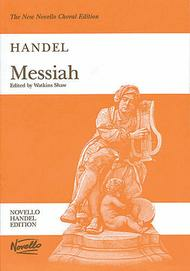 A sacred oratorio arranged for SATB with piano part. Edited, with piano reduction, by Watkins Shaw. Paperback Edition. I absolutely love this edition. As an organist, it's wonderful to have an edition that incorporates a realized organ part. Very easy to use. Takes a little while to break it in, though. 52 of 93 people found this review helpful. 58 of 99 people found this review helpful. 99 of 174 people found this review helpful.